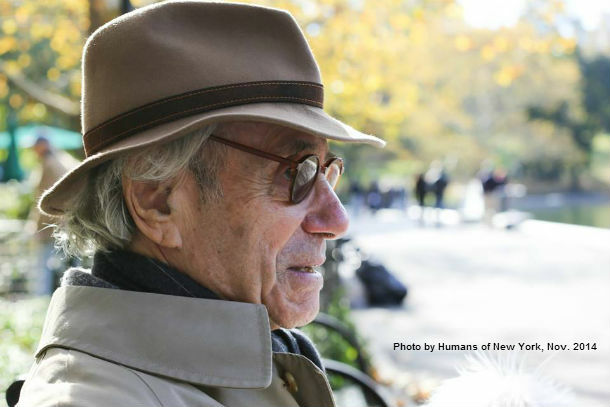 Humans of New York, a website of photos and interviews with New Yorkers, was created and is operated by one young photographer who calls himself simply “Brandon.” It features Sidney Offit today. Offit is a writer, nearly 90 years of age, who is better-known as a friend of the famous, a memoirist, and a curator of great writing—he helped found the National Book Critics Circle, which gives out one of the top-level book awards each year. 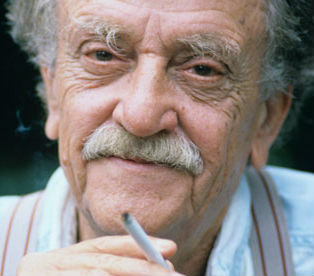 Offit was great friends with Kurt Vonnegut for four decades. Vonnegut’s birthday is tomorrow, November 11. He would be 92. He lived to be 84 and he considered what he told Offit to be a sort of ideal, but it was one he fell short of again and again, as he published fiction past 75 and opinion pieces until the end. The accidental beauty of a pacifist writer born on November 11, which is Armistice Day—Veterans Day in the U.S. since 1954—was not lost on the novelist. The moment war ends is not a moment that ennobles the war effort that preceded it, or converts the two opposing sides into concrete moral certainties like right and wrong, but that one minute of peace is sacred. It may have been the only minute of serenity the world has known. In Vonnegut’s work, remembering the past is sometimes the only way for a character to know that there even is a now. The past, the present, and the future may as well as be characters in his books. Three characters, each of whom considers the other two as being irritating and self-important. Here is a thought that I, Mark, visit and re-visit: I see an old photo of myself and I think I can return there. A previous year, another existence, is merely another place I have visited, lived in, breathed the air of. The 1990s are only as far away as a bus ticket whose price is a bit out of my reach; I think I can visit 1979 as easily as visit Phoenix if I would just save up for a couple months. I am going to see Vermont again, I am going to visit Iowa again; I have not seen the Pacific Ocean yet, but I know I will. Next year, maybe. I know what the 1980s sounded like, what food tasted like then/there, just as I know what Cedar Rapids, Iowa, or Poughkeepsie, New York, sounds like. The ability to visit one (Poughkeepsie) but not the other (1983) offends me. Now is all we have and Vonnegut knew this, better than most. Reliving the firebombing of Dresden in February 1945 is fine, was necessary for him; coming to understand that February 1945 and November 1918 and November 2014 all co-exist in an eternal now is spiritual, somewhat; finding oneself frustrated at the expense of a bus ticket to 1983 is Hell in its exquisite pointlessness. In one of his last interviews, recorded in October 2005, Vonnegut told public television’s David Brancaccio the point of it all. What life is too short and too long for. Oh, she says well, you’re not a poor man. You know, why don’t you go online and buy a hundred envelopes and put them in the closet? And so I pretend not to hear her. And go out to get an envelope because I’m going to have a hell of a good time in the process of buying one envelope. I meet a lot of people. And, see some great looking babes. And a fire engine goes by. And I give them the thumbs up. And, and ask a woman what kind of dog that is. And, and I don’t know. The moral of the story is, is we’re here on Earth to fart around. And, of course, the computers will do us out of that. And, what the computer people don’t realize, or they don’t care, is we’re dancing animals. You know, we love to move around. And, we’re not supposed to dance at all anymore. Kurt Vonnegut has written so many things I find to be like magic as someone who writes. Great article, Mark. I shared it with a couple friends who I know will enjoy it. The orples and I are so happy to hear that we’re just here to ‘fart around’. LOL. You just made our day.